The Ecostrad Sunglo is a superb outdoor heating solution that's sure to keep you comfortably warm in style. Its robust IP55 protection rating ensures you can install it outside with complete confidence. Download the Ecostrad Sunglo manual here. For permanent fitting outside, the Ecostrad Sunglo must be installed by a professional electrician as it will need to be hardwired to the mains of your property. This is not a DIY task and should always be left to an expert. The Sunglo’s wall brackets are designed so that they can also be used to ceiling mount the heater. Please see the Ecostrad Sunglo manual for further information. Always ensure that the correct clearance distances are observed: the Sunglo must be installed more than 180cm from the floor and at least 40cm away from the ceiling and any adjacent walls. Sunglo infrared heaters come with a UK fitted plug and can be used as a freestanding unit when used with a compatible tripod. The Ecostrad Sunglo comes with an IP55 protection rating which means that it will prevent the ingress of most fine particles and is resistant to low pressure jets of water. This rating is more than suitable enough for permanent installation outside in most cases, however, for particularly exposed locations, you may require a product with a higher protection rating. All Ecostrad Sunglo patio heaters come with a 2 Year Manufacturer’s Warranty. When style is as important as effective outdoor heating, look to the Ecostrad Sunglo electric patio heater. 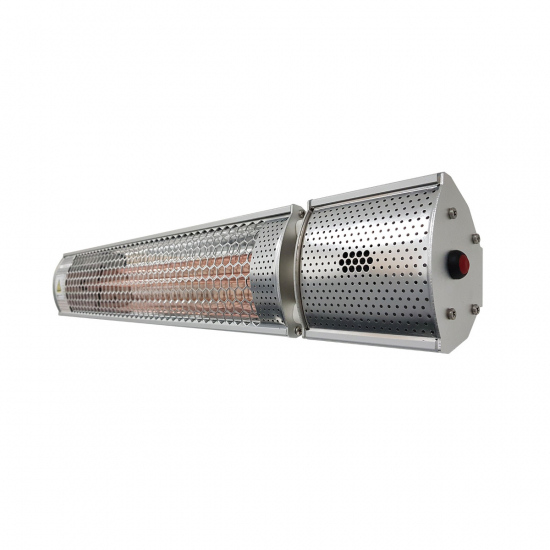 This sleek halogen heater sports an attractive honeycomb grill, providing a stylish outdoor heating solution for homes and businesses. Just as its name suggests, the Sunglo produces effective warmth and a soothing glow so you can make the most of your time in the garden. It gets to work the instant you switch it on by using invigorating near infrared: a strong form of radiant heat ideal for outdoor applications. By using special gold-coated reflectors on the inside of the housing, all of the warmth produced by the Sunglo is projected out to where it’s needed, ensuring your outdoor seating spaces are always kept well-heated. This infrared patio heater has a 2000w output which can be adjusted using the remote control provided. The remote allows you to select between 50% or 100% output so you can save energy on warmer days when full heat isn’t needed. If you’re unsure which setting is currently selected, the Sunglo comes with a convenient indicator light to display its level of output. A blue light shows that it’s at 50% output, green indicates 100% output and red means that the Sunglo is not heating. The Ecostrad Sunglo comes with a robust IP55 protection rating so you can install it outside with confidence. Its 16m² heated area will be more than enough for most domestic patios but multiple heaters can also be used to cover larger commercial spaces. Our Ecostrad Sunglo isn’t just limited to outdoor use – it can even be used in hard-to-heat indoor spaces, such as garages and workshops, that need effective and direct warmth. Ecostrad Sunglo patio heaters come with a 2 Year Manufacturer’s Warranty as standard and their tungsten filament HeLeN bulbs have an estimated 6000 hours of use. The brackets provided with the Ecostrad Sunglo give you the option of wall or ceiling mounting the heater as you see fit. Alternatively, you can also use it with a compatible stand for a freestanding fitting, or with our Ecostrad parasol brackets so you can direct heat to your outdoor dining area. Hardwired outdoor heaters must always be installed by a professional electrician, however, this is usually a quick and easy process with no lengthy callouts required. Lightweight, stylish and providing instantaneous heat, the Ecostrad Sunglo is an affordable luxury for any home garden. Ecostrad offer a diverse range of outdoor heaters so take a look at the rest of our selection for further inspiration. Radiant heat doesn’t have this issue – it works by travelling through the air in a wave, directly warming people and objects that it comes into contact with. Outdoor heaters use a more intense form of radiant heat called shortwave or near infrared which is more effective at counteracting the cooler temperatures felt outside, or in high-heat loss interiors that are difficult to keep warm. The type of heat they provide is just like the warmth felt from the sun’s rays and can make your outdoor seating areas a comfortable haven even if the ambient air temperature is less than ideal.